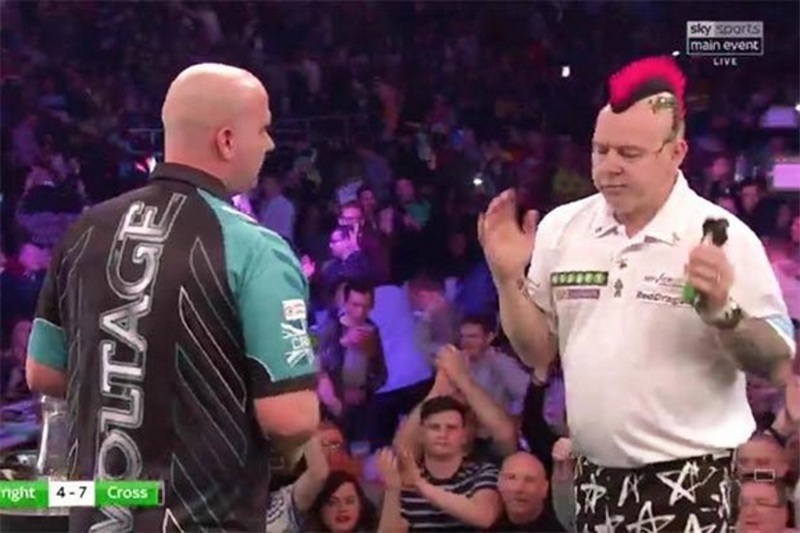 An angry Peter Wright refused to shake hands with Rob Cross after losing an ill-tempered match in Newcastle last week. Cross registered his first ever Premier League victory over world number two Wright, who was woefully out of form in the game’s closing legs. Snakebite has defeated Michael van Gerwen in the previous match. Cross guaranteed himself at least a draw after he moved ahead 6-3. Cross then looked to have fluffed his lines when he squandered two match darts in the 10th leg where Wright banked a 101 to keep himself in the game. His mini-revival was not to last long however, as he went on to miss a crucial three darts. This left Cross to capitalise on the opportunity and land a double 16 and with it his first ever Premier League win. The match’s main talking point came shortly after its climax as Wright refused to shake Voltage’s hands, causing an unexplained row for which the Scot has since apologised. In the night’s opening match, Mensur Suljovic took on Michael Smith with Bully Boy making it three wins from three in this year’s Premier League. Smith recorded two brilliant finishes of 72 and 68 to establish an early 2-0 lead before The Big Gentle responded brilliantly to level things out at 2-2. Smith wasn’t done there as he reeled off five straight legs, including finishes of 116 and 91, as he marched on to victory. This left the Austrian Suljovic cut adrift at the bottom of the table, without a solitary point so far this campaign. The second match of the night saw Gerwyn Price fight back from 5-1 down against Daryl Gurney to secure a point against his fellow Premier League debutant. Superchin Gurney initially raced 5-2 ahead but saw his lead chopped back after Price took down 148 which brought the score back to 5-3 before landing the following leg. A superb 136 finish in the penultimate leg was equaled by Gurney, who secured his point following a 15-dart hold in the decider leaving both players inseparable. In the night’s fourth match, Michael van Gerwen resumed normal service as he brilliantly beat Gary Anderson 7-3. MVG was back to his imperious best, averaging 110.62 and booking seven maximums to secure an awesome 7-3 victory and eradicate the memory of last week’s blip against Peter Wright. Anderson himself averaged a decent 110.79, which included four 180s along with two 177s. Despite the strong start, Anderson found himself trailing 2-0 after the first two sets, a gap he closed in two legs before edging briefly ahead in the fifth courtesy of a 170 checkout. Mighty Mike equalised in the follow-up set taking the lead soon after. It was an advantage he never threatened to squander, ably assisted by Anderson missing seven darts at the double over the final three legs. The action came to close after league leader Simon Whitlock maintained his 100% undefeated record by beating Raymond van Barneveld 7-4 in the final match of the night. Five-time world champion Barney had an off night, landing just 4 from 14 shots at the double. In contrast, his rival from Down Under, Simon ‘The Wizard’ Whitlock boasted an medicore 58% checkout success rate that might. On another night that have cost him dear but on this night was enough to secure yet another triumph, making it three wins from three on his Premier League return. The 2018 Premier League this week heads to the Mercedes-Benz Arena in Berlin on Thursday with coverage underway from 7 pm on Sky Sports Action HD and Sky Sports Main Event HD. Thursday’s action gets underway with Michael Smith up against Simon Whitlock, the unbeaten League leader with Smith himself sitting second in the table. I keep thinking that Whitlock’s time at the top is up; however, while I’m convinced the bubble will burst soon, I don’t think that will happen this week, even with Smith’s impressive form. Both men were relegated in their last Premier League campaign, but it shouldn’t go unnoticed that The Wizard’s only major title – the European Championship – was collected in Germany, making this happy hunting ground for the Australian. Next out are Gerwyn Price and Mensur Suljovic, with both men looking to pick up their first win in the event. Despite the Austrian being able to bank on the German crowd’s support — much like Price himself did last week in Cardiff — he has been woefully short of form and the only man to have lost all three games. This performance finds himself at bottom of the table and a favourite for the chop when the cut comes on judgement day five weeks from now. For this reason, I’m siding with the Welshman here to further strengthen his growing reputation in the game. The night’s third match brings Michael van Gerwen and Daryl Gurney to the oche in a match I just can’t see Mighty Mike losing — and we all know why. This match is followed by Rob Cross and Raymond van Barneveld, with Voltage finally looking like he is moving in the right direction following his dismantling of Peter Wright a week ago. Barney usually enjoys his time back on the European continent and the German crowd could be too much for Cross, just as the Irish were in Dublin on Matchday One when he crumbled in front of MVG. To be fair to Cross, he has a decent continental record in European Tour events and intriguingly is undefeated against Barney, winning three times. That said, I’m sticking with Barney to come on top in a close tie. The most anticipated match of the night is the all-Scottish affair between Peter Wright and Gary Anderson which brings the curtain down on the night’s action. The last time these two played was in the Grand Slam of Darts semi-finals when Anderson fell apart and Snakebite was able to come back from 14-8 down to win 16-15. For this alone, Anderson, evens at Betway, will be smarting and determined to set the record straight. Up one week and down the next, it is never easy to call Peter’s results, but he does usually do well in Germany, winning six tournaments there last year. And while Anderson has the upper hand, he also suffers from an ongoing back issue so I’m going to pick Snakebite in this battle of the Celts. Oddly, in the first three matches, the Scot has a draw, a defeat and just one Premier League win. But what a win it was, inflicting a rare defeat on world number one Van Gerwen two weeks ago, showing just what he can be capable of when he is on form. But I’ll be picking this following fivefold, again with Betway: Simon Whitlock, Gerwyn Price, Michael van Gerwen, Raymond van Barneveld and Peter Wright at 92/1. In another week of unpredictable upsets in the Darts Premier League, Peter Wright had one of those nights we all know he is capable of but seldom produces as he went on to shock Michael van Gerwen 7-5. Elsewhere, Rob Cross lost again, this time in a 7-1 thrashing by Simon Whitlock who, following back-to-back wins and a 100% record, now sits atop of the League after two weeks. Snakebite could only manage an unconvincing draw with Gerwyn Price last week, but his outlook quickly improved early in the fourth leg as the pre-match 6/1 underdog maneuvered himself into a 3-1 lead before MVG raised his game enough to level the match. Wright though soon quashed his opponent’s rebellion, punishing the Dutchman for three missed darts at the double and taking out a 116 to move back into the lead. Before long he found himself within one leg of guaranteeing at least a point and victory within reach. Soon after, Wright landed his third maximum of the match on his way to a 12-darter, followed swiftly by a 13-darter. “>warning on Twitter that the Instagram account swhitlock180 is fraudulent and in no way affiliated to the Aussie professional. So there. Back to the oche where 27-year-old Cross has now lost his last six matches, with his only win since January 1st coming at the Masters first round against Ian White. Despite his current downswing, Voltage was the odds-on favourite pre-match but instead it was the Wizard who conjured up another win. There were no such issues for Gary Anderson who comfortably won his grudge match against the Welsh crowd’s favourite Gerwyn Price, whose scoring simply let him down while Anderson produced his best performance of the season so far to win 7-3. Price did manage to bank an average of 92.71 but only chucked off eight shots at double whereas Anderson posted an average of 99.22. Raymond van Barneveld scored his first win of the season with a 7-5 victory over Mensur Suljovic in a much tighter affair where both players averaged over 100. The game hinged on Suljovic missing three attempts at the double in the fourth leg leaving the door ajar for Barney to sneak in and land a 167 checkout to move 3-1 up, a lead that widened a leg later. From there, the remaining legs were shared equally leaving the Barney to take all three points. The League’s only other 100% record was held on to after Michael Smith recorded a 7-4 victory over Daryl Gurney in the night’s opening match. Bully Boy stormed into a 3-0 lead, with the help of a 124 checkout. Numerous 13-darters and 14-darters were to follow before a fourth 180 of the match put Smith ahead 5-4. Smith capitalised on his rival’s four missed double attempts to go 6-4 up before nailing the final leg too. This week’s action sees our heroes head to the Metro Radio Arena in Newcastle – catch the action live on Sky Sports Main Event HD and/or Sky Sports Action HD from 19:00 (GMT) – for week three. The first game of the night features Mensur Suljovic and Michael Smith with the former currently on a great roll sharing the top of the table with a 100% win rate. In contrast, Suljovic is in the opposite situation, although it was Mensur that beat Smith in the Masters only a matter of weeks ago, making this something of a cloudy bet. That said, we’re putting our money on the Englishman at 11/8. This match is followed by the Daryl Gurney and Gerwyn Price contest in which we’re siding with Gurney despite both players slightly under-performing at the moment. The reckoning here is that Gurney is showing the better form of the two right now. Again, Price should be more than comfortable against Superchin and actually beat him at the Masters, but I’m backing the Northern Irishman to emerge victorious this time around. Hands up, Peter ‘Snakebite’ Wright caught me off guard last week. I was not alone in expecting World number one Michael van Gerwen to do what he so often does and wipe the floor with his opponent. Yet, it was the Scotsman who won on the day. He now meets up with another player to have beaten MVG at the oche, Rob Cross, who has barely won since. On that note, we could back a draw now, but given that I simply don’t have faith in Rob Cross on the Premier League stage right now, I’m selecting Snakebite to march on in the Premier League with another win. Thursday’s match number four is a whopper as the world’s number one and two collide when Gary Anderson meets Michael van Gerwen. Mighty Mike was defeated last time out but won’t lose twice in a row so he can be safely expected to bounce back and win this week. This is even more likely given the grief Anderson keeps getting from his bad back which might continue to plague him again. Yes, Peter Wright managed the task last week but whether or not Gary is up to it yet is another matter. Finally, league leader Simon Whitlock meets the legend that is Raymond van Barneveld. Barney is looking good on three points so far, and he’ll be aiming to leapfrog his opponent at the top of the table with a win. This is providing that Michael Smith loses the night’s opener against Mensur Suljovic. That, for me is more than enough encouragement to pick Barney on Thursday night. 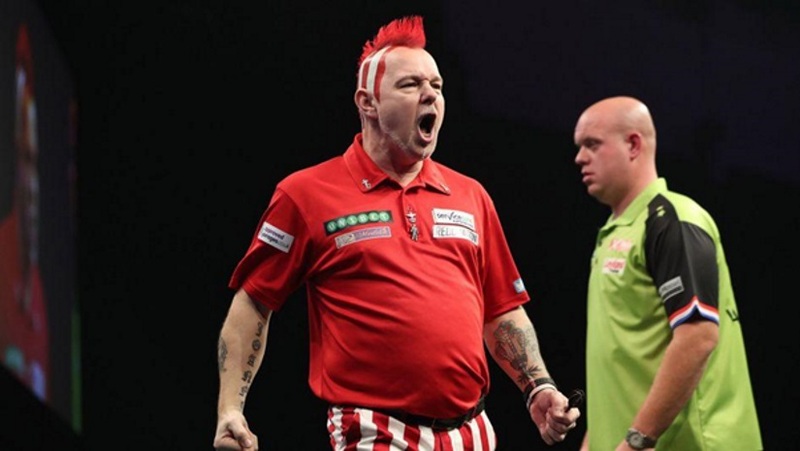 Try this 6/1 Betway boosted treble of Peter Wright, Michael van Gerwen and Raymond van Barneveld all to win. Or if you are a bit more daring, try Michael Smith, Daryl Gurney, Peter Wright, Michael van Gerwen and Raymond van Barneveld, which is worth over 28 to the pound, again at Betway. Rob Cross’ miserable time since the New Year’s Day heights of Ally Pally continued as he suffered another loss, this time at the hands of Michael van Gerwen administering a slice of retribution. The Dutchman began the defence of his Premier League title in a 7-2 win over the PDC world champion in a battle of the baldies in Dublin in which Mighty Mike landed three 114 checkouts and averaged 100.80. For MVG, who was beaten by Cross in the World Championship semi-final in December, success was sweet and served to remind his young rival that he remains the game’s super power. Elsewhere, Michael Smith marked his return to the Premier League after a 12-month absence by fighting back from a 5-1 deficit to brilliantly beat Gary Anderson by 7 sets to 5. Anderson was once again plagued by a troublesome back injury that saw him miss 18 darts that would have otherwise guaranteed him at least a point. In another tough result for the tipsters, 2012 Premier League runner-up Simon Whitlock overcame match favourite Mensur Suljovic in the night’s first match, also by 7 sets to 5. The Aussie needed to claw himself back from 3-1 down, racking up an average of more than 106 against his debutant opponent who was the early leader in the contest. Suljovic then missed a vital dart at bullseye that would have given him a comfortable 4-1 lead but instead opened the door for Whitlock, who spiked off a succession of 14, 12 and 11 dart legs before an awesome 160 handed him a winning two-leg advantage. Premier League new comer Daryl Gurney and oche legend Raymond van Barneveld took home a point each after Grand Prix champion Gurney missed three crucial darts that would have landed him a debut victory pleasing the Irish crowd in the process. However, these were gratefully snapped up by his rival in spite of a late missed bully shot. Finally, another debutant, Gerwyn Price, walked away with a share of the points, having won the final three legs in his opener against Peter Wright. Snakebite, who confirmed punters’ long-standing concerns over his change in darts, duly missed four shots that would have provided him the opening victory. Instead, Price twice battled back from 5-1 and 6-3 down before bagging five out of the last six legs to bank a point. The Welshman moves on to a home game in Cardiff where this week’s Matchday Two games take place on Thursday night at the Motorpoint Arena with coverage getting underway from 7pm on Sky Sports Action. The Premier League Darts season finds itself in its second week in Cardiff and the action gets underway with Michael Smith versus Daryl Gurney in a match where we are backing Bully Boy Smith to take the win, against the much fancied Superchin. This is followed by another toughie – although there are no easies in the Premier League – as Rob Cross meets Simon Whitlock. Cross is certainly finding out the hard way that life is tough at the top and will be looking to bank his first ever Premier League points here against Whitlock, who was a surprise winner last time out. A loser last week, Cross played well enough in Dublin, but MVG was in an imperious form. The World Champion now has the chance to put things right against Whitlock, an opportunity which I expect him to take. 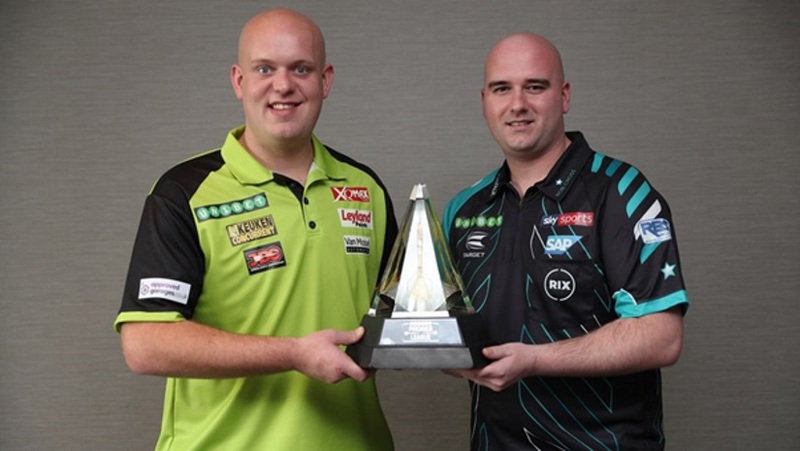 Next up, Michael van Gerwen takes on Peter Wright with the Dutchman having stopped Snakebite in the Premier League final last year. Wright has a woeful head-to-head record against Mighty Mike; despite often showing well, he historically drops the crucials when it counts. I wouldn’t be expecting a shock here either as MVG powers on to his second straight League win. Gerwyn Price will step up next in a match that his rival on the night Gary ‘The Flying Scotsman’ Anderson has already spiked with a not-to-be-forgotten taunt dropped at their last meeting when the world number two joked, “If you can’t beat a man with a bad back, you better go back to the practice board”. Now, Price — in Cardiff of all venues — has the chance to do exactly that. With the Welsh crowd likely to be against Anderson, the temperamental Scot could implode, especially if his bad back continues to bother him, so I would be picking Price to be right here. Soon after match four, Raymond van Barneveld and Mensur Suljovic will step out with Barney having lost to the Austrian in their last meeting making Suljovic worth a shot at 15/8. That said, Barney will inevitably be the crowd favourite and has shown the occasional glimpse of his former self. For this reason, others might fancy him at 11/10, although I’m looking at a Suljovic win to close out the night. Try this treble bet at Betway: Michael Smith, Michael van Gerwen and Mensur Suljovic at 10/1, or be brave and chuck in Cross and Price for a five-fold worth 57/1. Also, it might be worth paying attention to Betway’s boosted price of 9/2 for Cross, van Barneveld and van Gerwen to win, two points higher than its original price of 7/2.